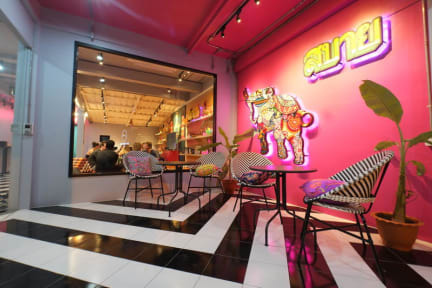 Let Everyday Bangkok Hostel@Khaosan be a part of your journey. In addition to our distinctive concept, vibrant décor, and hospitable staff, our great location is also another highlight. Only 10 minutes’ walk away from Khaosan Road, it is a great starting point for your everyday journey. Here is also a friendly place for you to meet fellow travelers from around the world. Everyday Bangkok Hostel@Khaosan is ready to offer great experience and beautiful memories for all our guests, and you will feel that ‘24/7 in Bangkok is unforgettable’. Excellent value for money (private room) compared to similar offers and maybe the cleaniest place I have stayed at in Thailand. I highly recommend a stay there. Molto molto bello. Ostello accogliente, personale disponibile tantissimo, pulizia ottima e posizione vicino ai templi. Non saprei proprio che altro aggiungere, top!